A few things happened the past few days. I saw a couple of weeks ago that actress Erica Hubbard was going to be at Colonial Williamsburg as a guest performer during their Steadfast Spirits programming. Reading the description of events, I knew that she would be portraying a woman named Lydia who was once the slave of George Wythe. Mr Wythe was among other things, one of the signers of the Declaration of Independence. Cool right? Then I saw a tweet on Thursday that directed me to an article in the Washington Post by J. 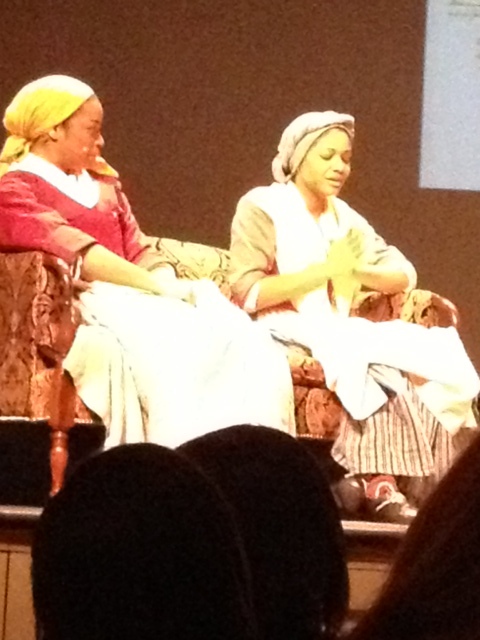 Freedom du Lac talking about how difficult it is to portray slavery or get people willing to do it at historic sites. The article focused on Hubbard’s journey to portraying Lydia and why the subject of slavery is a “tough sell” at places like Colonial Williamsburg. Found myself nodding and agreeing with much of it. When I see an event I think the public should attend, I usually will send a tweet about it. I’ll post something to facebook. And when I have a computer that actually loves me, I can blog about it before it takes place. (I really need to get a new laptop, but a root canal is in order first). So I did. With encouragement from Taylor Stoermer who was on the writing staff for “Liberty for Lydia”, I made the decision to show up so I could indeed share my thoughts. Of course I had to find a way there. So I did. I had an appointment for work earlier in the morning in Hampton. I managed to knock that out and make my way to Williamsburg. I didn’t purchase a ticket ahead of time just in case something came up and I couldn’t make it. So day of, I head over to buy my ticket and find to my great surprise, tickets were $10 the day of! I would have gladly paid the $30 price that was listed before but I’ll take a ticket that is $20 cheaper any day. What I witnessed afterwards was just amazing. I wanted to blog about it Saturday night and had just thought after thought running through my head as I was driving home so instead of letting those thoughts just slip away, I recorded my blog entry. 13 minutes of talking to myself into my phone while driving down 64E, I leave my thoughts. I’m driving back from Colonial Williamsburg and I was really impressed with how Erica Hubbard embraced the role of Lydia. I know that it’s difficult for people whose background isn’t necessarily in history or they’re not very comfortable with certain aspects of history, to embrace the role of an enslaved person. But you could see the struggle for clarity in her facial expressions and in her emotions, and it poured life into Lydia and it was interesting to watch that take place and know, you know this was information that was at first difficult for her to understand and kind of portray but then as she got into it there was an empowering moment that happened, which she did talk about in the discussion at the end. Hubbard said that after doing this, she felt empowered to do just about anything from the strength she gathered from Lydia. As somebody who trains historic sites to talk about slavery, I have an easier time doing the interpretation because I separate myself from the narrative. I don’t get emotionally vested in it because when you do, you tend to get angry, and you tend to put more personal feelings in it when your job is to convey the thoughts and the feelings of the person you’re representing. Something I learned however, and what I did like about Erica’s method is as an actor, she said she had to use substitution to find those appropriate emotions to show and so I got to see how actors might prepare for interpreting slavery. I don’t take that approach because the historian in me is kind of rigid and I see the documents and the narratives and as a third person interpreter, I am merely a conveyor of information and history. Nice to see how both sides of the coin work to get the same message across. I have to say, it is really interesting watching people whose main job is not the study of slavery or life within this institution or the lives of the men and women who were treated as property come in and portray slavery. To see them embody what I study and do for a living is kind of amazing. But when you have the support and instruction of Colonial Williamsburg , it does seem a little easier. And yes, the good folks at CW showed out going above and beyond anything you could expect, especially with a theatrical performance that dealt with slavery. I recently saw a theatrical performance doing the interpretation of a well known African American figure and I was not impressed. That particular performance that made me remember why I don’t like theatrical performances of slave life, however, the professionals at Colonial Williamsburg gave me hope that it can be done, respectfully, and with context.Not that I didn’t believe they couldn’t do a great job with a theatrical performance showing the story of enslaved men and women, but after seeing such a bad performance before, it was really nice to see that it wasn’t cartoonish, or showy, it just was interpretation. 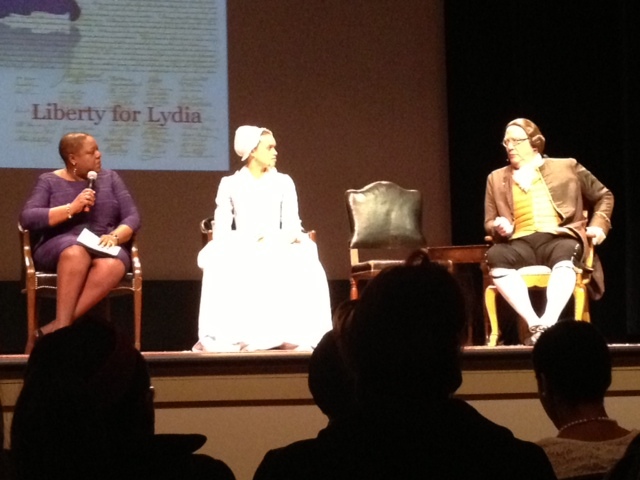 During “Liberty for Lydia,” it felt as if I was sitting in the Wythe living room with Lydia talking about those emotions and what it’s like to be free and how she’s going to stay with Mr. Wythe for a while until she gets on her own. For those that interpret, this is what we strive for. It is easy for visitors to see it just as acting and entertainment, and “ohhh, this is just so wonderful” that they miss a lot of the historical content that’s being put forth. What CW did an amazing job with was create a complete history lesson and deliver it through performance. I know the history but it’s nice to hear it being delivered in a way where you cannot miss the points being given. It’s not just about memorizing lines,but about being able to deliver a history lesson, where you are giving facts, names, dates, figures, places, things that occur. Showing what the house was like and showing what the atmosphere was like for those slave owners who were morally convicted about the institution of slavery and then watching them process with their enslaved staff, “I believe you should be free but I can’t free you right now, I don’t know when I’ll be able to and yes this is wrong but I’m not going to push for it if it means tensions between those we need in our fight for independence from Britain”– I think that particular conversation with Lydia and Mr. Wythe where they discussed why he couldn’t just let her go was really important because it does show that there was a moral struggle and that these conversations would have taken place between some slaves and their owners. Which brings me to another point that was brought out in “Liberty for Lydia”. In today’s age we tend to think that within the household it was the slaves in one corner and the whites in another corner and never the two met, but that wasn’t true. There were human relationships involved, there were these conversations, granted not every slave would have been able to have that kind of conversation or that kind of relationship with their owners that Lydia had with Mr. Wythe, but to know that there were those instances is something. A lot of times we don’t want to focus on those occasions because then it looks like we’re prettying up slavery, but for some people today, they don’t understand that at one point it was illegal for a person who owned slaves to actually free their slaves, so these conversations of ,”if I could, I would” are important to highlight and important to talk about. There were men and women that wanted slavery to end but they really couldn’t take those legal steps to make that happen, and to be able to see that that interaction between slave and slave owner is powerful. During the discussion period there was a visitor who asked if “Liberty for Lydia” was going to go on the road–he felt like this was something that everybody needed to hear. The simple quick fix answer is to say, well yes, this should be everywhere but the reality is, you need the right cast of interpreters, and you need an audience that is going to be receptive to this particular message. But for that kind of desire for this production to be taken abroad if you will and it’s AFTER February and after D’jango’s been out, people still want to see these types of portrayals of slavery and the desire for freedom that African Americans had…that’s incredible and it’s what interpreters who are in this particular field hope for. Another aspect of “Lydia” that I loved was the story of Aggy Randolph. I know that the story was about Lydia and her liberty, but I hope that there is an avenue to do something of this magnitude for Aggy Randolph because her story is something that people need to realize actually happened. She had a loving relationship with a white man that owned her, and they had a family. It was an incredible dynamic because the struggle she faced was his family not giving her the freedom that was stated in her mate’s will. I thought it was powerful because Aggy said that they lived as a man and a wife should, and here she was being denied the promise of her love. Aggy feared for her children being sold and she was concerned that she nor her children would ever see freedom in her lifetime, all because his family did not approve of their relationship. I would love to see a portrayal of what that family life was like and the things that they encountered, through their relationship and through the openness of their relationship. It seemed like Aggy and her spouse were very transparent in what they were doing and I liked the way her particular character was brought out simply because not only does it raise questions that weren’t asked, but it raised questions for the public historian that I am, like, “are we ready to go there? Are we ready to talk about the actual loving relationships that weren’t brought out of servitude, in the sense that they were consensual and not, “he raped his slave and therefore she is forced to go along with this relationship because he owns her”. This looked like it was a genuine relationship that looked like two people fell in love in spite of the circumstances. I hope that we will begin to see more of that because it does show the complexity that arises in slavery. There is the attitude that “oh, he owned her, so he felt like he owned her body and forced his will upon her”, but not all relationships were like that and it’s important that as we get a better understanding of what slavery was like and what slave life was all about…see start to see that it was complex. There was no black or white answer to anything. There’s always some kind of monkey wrench gets thrown in and I feel like it’s not our place to really judge the thoughts and emotions of people who we know nothing about but more or less learn about their lives in the time that they existed. We are constantly struggling to learn more about the human relationships that existed and I’m not saying there weren’t relationships that were pure force and the abuse of power, because there were. But for as many relationships that were based out of forced will, there were a handful that were relationships were filled with love. So how do we address that and how do we gear or public for that discussion? It’s my selfish hope that the good folks at Colonial Williamsburg will take that into consideration for a future production. I know that will make a few people shift in their seats, but it’s something that I’m really interested in learning more about, something that the public should learn more about and because relationships really get into the heart of how sticky the institution of slavery was. It takes this horrible institution and exposes the humanity and inhumanity at a level we ignore. There were still these very human if not forbidden relationships that nobody wants to discuss because we always want to think the worst when it may not be the most appropriate thought process to have. That’s one of the main things I get from studying slavery and doing interpretation. When you go in to it with an open mind, you understand the position that people on all sides were in. For slave owners, some thought, “if I owned people, because they are a substantial amount of money, that will make me money and give me status and give me a better life.” There are always going to be people who want a better life, but it’s the lengths that they go through to obtain that better life. It may not be the most moral thing and it may not be the most ethical. Today we are afforded the ability to look back and say “that’s just horrible” but back then, it was a very real decision for those who had the ways and means. Understand that it does not excuse the actions, it just helps when you have to constantly ask yourself “why would they do that?” And let’s not forget it was not just whites who owned slaves and were faced with these decisions, there were African Americans who owned slaves. I’m not talking about the men and women who owned their family members in order to keep them together. I’m speaking about the men and women who owned slaves so that they could have status and wealth like the whites around them. They too had the desire to have wealth and they understood that in order to do that, they needed to obtain property and that property came in the form of persons and land. It is these topics and more that I hope more and more people pay attention to. That’s why there are groups of African Americans that interpret slavery. We feel it is important for the public to know their history…all aspects of it. We can’t all be feel good stories, we can’t all be depths of death and despair. We do have a foggy middle that is just as important to know about as the high and low end of the spectrum. Sites like Colonial Williamsburg that are not afraid to talk about slavery and push buttons and take the lead are needed so that conversations can take place whether they are comfortable or not. They provide the blueprints for other sites letting them know,”this can be done, it doesn’t matter who you have on site, tell the story as it should be told.” You find a way to do it, if you want to be true to your mission, you find a way to do it. Those, folks, are my lengthy thoughts on “Liberty for Lydia”. I would have loved to stay and meet Erica Hubbard and just thank her for taking the role because I know there are people that looked at her like why in the world would you do this and it’s nice to see someone else take up the challenge. I know this wasn’t an easy thing to do but it is nice to see someone of her stature stand up and say this is our history and I need to embrace that and I hope it leads her to learn more about slavery, find the humanity and get strength from those who made it through! Nicole, Thank you again for your inspiring words. As a tour guide at Magnolia Plantation in Charleston, SC, a Civil War reenactor and the founder of the Slave Dwelling Project, I can certainly relate to the fact that interpreting slavery is no easy task. There are those Black and White who would much rather have that subject matter go away. Despite that, we must press on none-the-less. I will see you in Gettysburg, PA in a few days. I saw a wonderful interpreter at Mabee Farm in upstate New York, near Syracuse. He was so moving.